Autoclaves & Sterilizers include the Benchmark BioClave Benchtop Autoclaves, the Benchmark BactiZapper Infrared Microsterilizer and the Benchmark Micro Bead Sterilizer. The range Autoclaves & Sterilization Equipment from Benchmark is ideal for the sterilization of small research tools and consumables in any lab. Benchmark Autoclaves & Sterilization Equipment are also economical when it comes to benchtop space, having small footprints, for use on even the busiest worktop surfaces. Steam sterilization of research tools and consumables is convenient and affordable with the new digital BioClave Benchtop Research Autoclaves. With a width of under 18 in. (under 14 in. for the BioClave Mini), both models will fit comfortably on even the most crowded benchtop surfaces. However, despite this space-saving external dimensions of the Bioclave autoclaves, the stainless steel chambers are surprisingly large. They accommodate a variety of liquids, media, instruments, glassware, plasticware and other common research laboratory items and equipment. 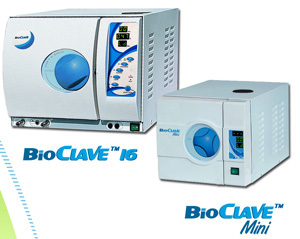 Both the BioClave Benchtop Research Autoclave and the BioClave Benchtop Research Autoclave Mini models include a mechanical and electrical safety interlock that prevents the door from being opened until the pressure has dropped to zero PSI. Benchmark BioClave Benchtop Autoclaves are equipped with a large digital display and fully automatic operation, all segments of the cycle (fill, sterilize, exhaust and dry) commence and run to completion by simply pressing the start button on the BioClave autoclave unit. An optional thermal mini-printer is also available for providing a printed record of the sterilization parameters and a USB drive can be used to record settings and transfer them to a PC. The Benchmark BactiZapper Infrared Microsterilizer has an asbestos-free core element that uses infrared heating to produce temperatures of up to 815°C (1500°F). The Benchmark BactiZapper Infrared Microsterilizer completely sterilizes items such as platinum inoculating loops, needles, glass tube/pipette mouths and various metal & borosilicate glass instruments used in quality control and research, is as short a period of time as 5-7 seconds. 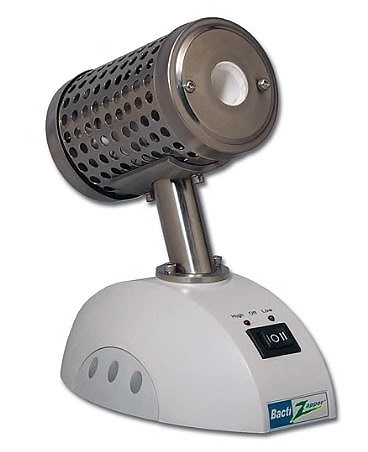 The Benchmark BactiZapper Infrared Microsterilizer uses well established and proven infrared sterilization technology to provide instant sterilization of platinum inoculating loops, needles, glass tube/pipette mouths and various metal & borosilicate glass instruments used in quality control and research. The Benchmark BactiZapper Infrared Microsterilizer also has a lower temperature setting of 500°C that can be used as a “standby” and which extends the usable life of the instrument. A Benchmark Micro Bead Sterilizer is ideal for the sterilization of small research tools (forceps, scissors, etc.) When the chamber is filled with the included glass beads, high temperatures (up to 300°C) can be used to eliminate the presence of bacteria, spores, and other microorganisms. 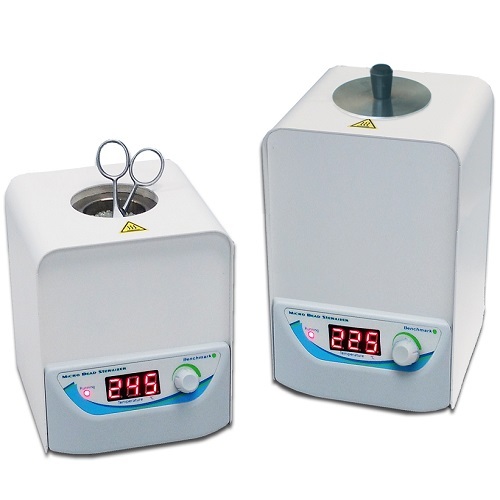 With adjustable temperature, the application range of the sterilizer can also be expanded into incubations and the decontamination of plastic objects/tools.